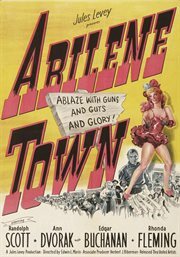 The item Abilene Town, (electronic resource) represents a specific, individual, material embodiment of a distinct intellectual or artistic creation found in San Francisco Public Library. In this dramatic antebellum tale, homesteaders battle each other in the legendary cow town of Abilene, Kansas. Director Edwin L. Marin (Tall in the Saddle) coaxes fine performances from the likes of Ann Dvorak, Edgar Buchanan, Thonda Fleming, Lloyd Bridges, and Randolph Scott, who headlines the star-studded cast, so saddle up and hang on!